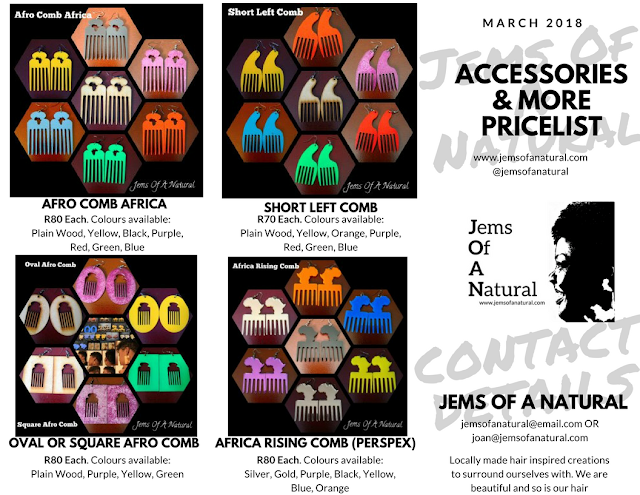 We have complained and wondered and wished and prodded and asked and hoped and imagined and and and and Clicks have finally come on board with stocking more hair care products for natural hair as well as arranging events to introduce some of the brands to us all such as the #ClicksCurls event which already took place in Johannesburg in March and will now take place in Cape Town in September. The best part of it all (in my view) is that the event is now open to the public and has even more brands showcasing their products. Awesome! After receiving the press release, I decided on sharing it here and everywhere...Cape Town, you are in for a treat. Please get your tickets early! 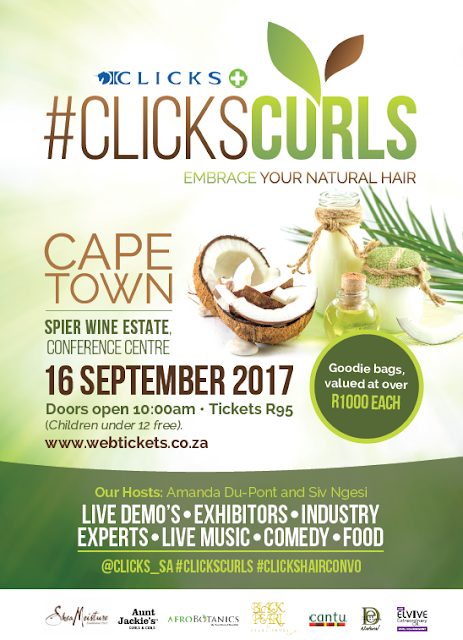 Clicks, South Africa’s leading beauty retailer, is excited to announce #ClicksCurls Cape Town at Spier Wine Estate on Saturday 16 September 2017 – an expo dedicated entirely to waves, curls and coils! Hosted by the fabulous Amanda du-Pont and dynamic Siv Ngesi, #ClicksCurls Cape Town will feature the best of local and international natural hair brands. Gold sponsors include Shea Moisture, Aunt Jackies, Cantu, Design Essentials, L’Oreal Elvive Curl Nourishment, Afro Botanics and Black Pearl by Pearl Thusi. Silver sponsors include Caivil, Dark & Lovely Au Natural, Garnier Ultimate Blends, Hask, Jane Carter, Maui Moisture, My Naturals, Not Your Mothers, Palmers, Shea Moisture, Sunny Isle, Tropic Isle Living and Twisted Sista. Expect live hair demo’s, industry experts, music, comedy, food for sale and lots of curl conversations with your favourite naturalistas. Plus, there’ll be a guest appearance by Nomzamo Mbatha (L’Oreal Elvive Curl Nourishment) to give you inspiration and tips for rocking your crown. #ClicksCurls Cape Town promises to be a girls day out to remember, with awesome goodie bags valued at over R1000 each and exciting giveaways – a curly-girl’s dream come true. Venue: Spier Conference Centre, Spier Wine Estate. Doors open at 10am. Tickets are available at R95 each. Children under 12 are free. Visit www.webtickets.co.za. Like I said - GET YOUR TICKETS NOW and enjoy every second of it.